Some have called Naples a "porous city" . And they claim that its sounds, too, cannot resist the temptation to lurk everywhere and nowhere, almost as if they liked to disperse. Many of the sounds and hidden stories of Naples, which is presently going through yet another dress rehearsal for its renaissance, have captured the attention of Eugenio Fels. In Alkèmia (1995), Fels improvises at length, becoming one with abstract images projected on the body of a dancing woman. He combines melody and harmony in a disconcerting and expressive play of tone-colors. Atitlàn (1989) blends late Romantic elements with stylistic elements drawn from what I have often called "Italian Minimalism". 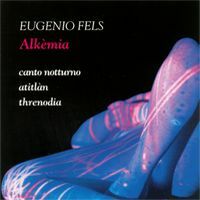 In Canto Notturno (1993), Fels further pursues his quest for a fusion between melody and a daring harmonic accompaniment. Threnodia (1994), for alto and keyboards, written on commission for the film Fade Out, speaks of the composer's evocative ability, capable of drawing on the past without denying the future.